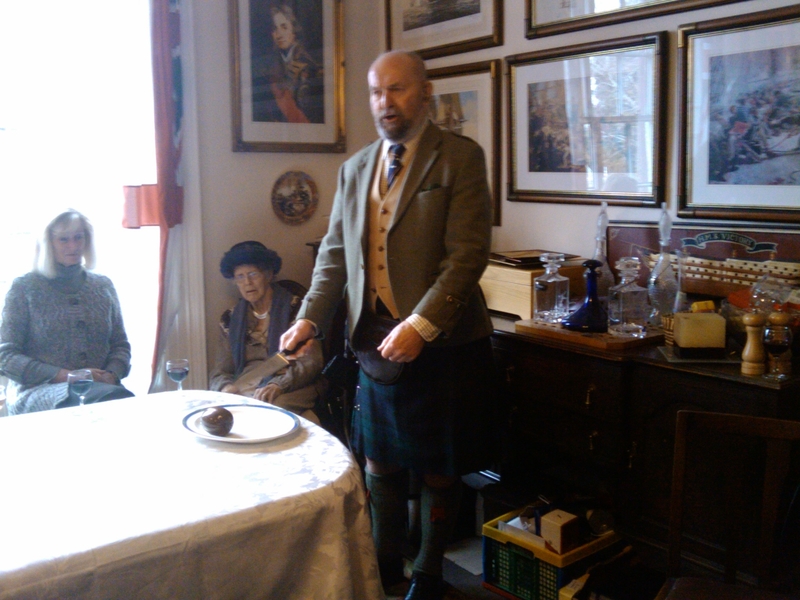 Kirriemuir Rectory – Alastair Addresses the Haggis in time-honoured style. A good time was had by all. So preparations are in train for my trip to the Primates’ Meeting which begins tomorrow in Dublin. I am asked to bring with me something – photo, symbol, object, etc – which might express where the Scottish Episcopal Church now is and the issues which it faces, etc.,etc. You know the kind of thing, I am sure. So what do you think ….. ? I have a fall-back idea myself but suggestions are always welcome. We thought it was funny to offer a teeny-weeny haggis on an enormous plate, but not many others thought so, as you can tell. I know that there’s a picture of the crozier hook wending its way to Dublin but what other things could depict what the Scottish Episcopal Church is? A spiderweb?